B.E. 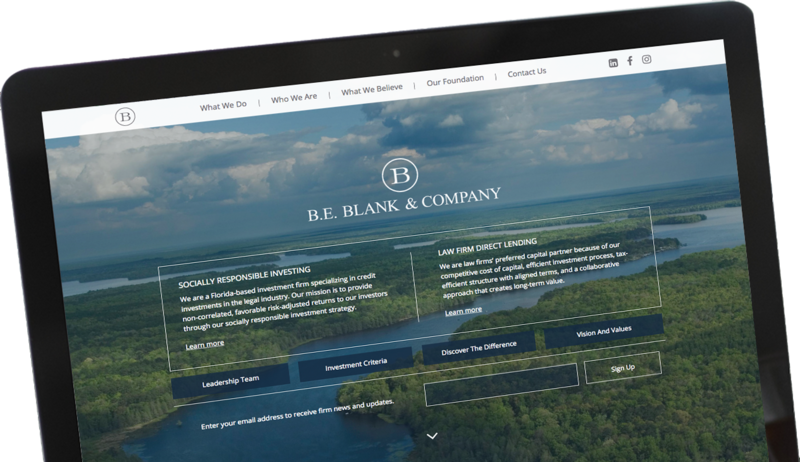 Blank & Company is a Florida based-investment firm with a lofty vision of a future where conscious capitalism can inspire law firms to operate at the highest ethical standards. Through a socially responsible strategy for credit investments in the legal industry, they provide favorable returns to investors, creating long-term value for all partners in the process. To take their firm to the next level, B.E. Blank & Co sought a digital transformation that would showcase their vision and class. TECKpert partnered with B.E. Blank to turn their vision into reality, combining elements of design and development to deliver on their goals. We knew that it was important to show B.E. Blank as distinct from the typical modern firm that uses Brickell city scenes and beachfront shots to signify their connection to the area. 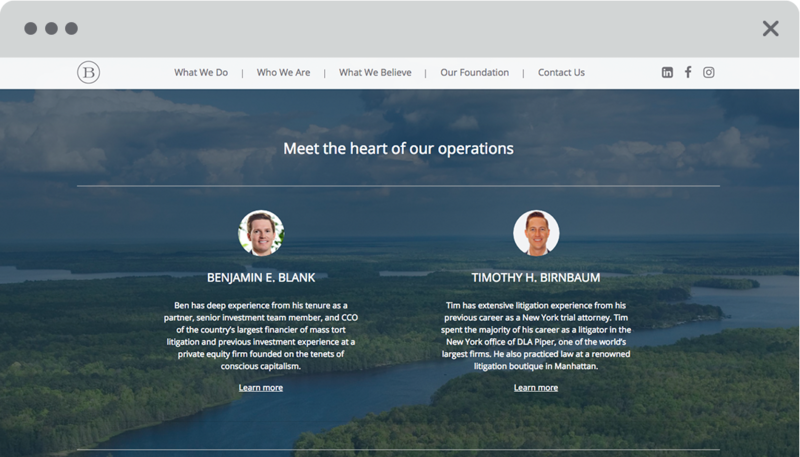 To achieve that, our team created a clean, visually stunning website where key information is overlaid on a scene of the Everglades. As a whole, the site both invokes the feel of South Florida and demonstrates B.E. Blank’s dedication to the health and future of the region. For B.E. 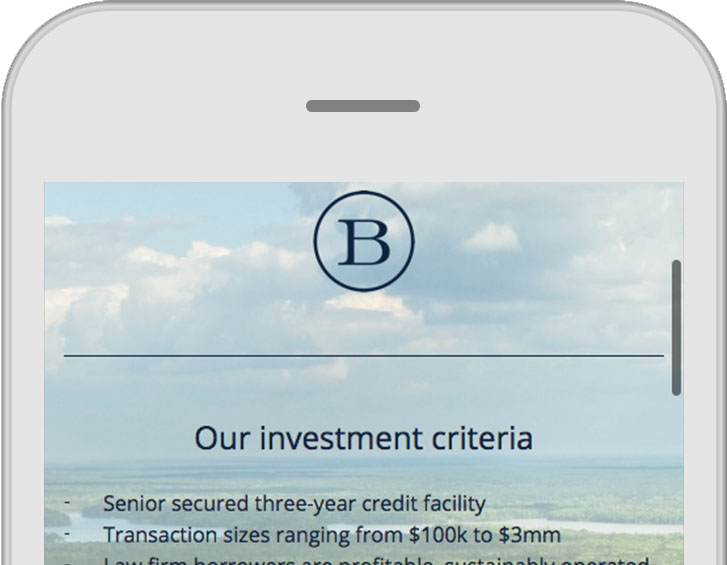 Blank, an important element of this digital transformation was that it would support their growth and appeal to a specific, sophisticated audience of potential investors and law firm beneficiaries. TECKpert’s experience with these industries allowed us to shape B.E. Blank’s digital assets to support these goals, as well as lay the groundwork for future digital marketing and outreach efforts. See the site at http://beblankco.com. B.E. Blank & Company is a Florida-based investment firm specializing in credit investments in the legal industry. Their mission is to provide non-correlated, favorable risk-adjusted returns to our investors through our socially responsible investment strategy. "I thought Carlos, Luis, and the entire TECKpert team did an amazing job. They were very receptive to our feedback, creative and proactive with their design, and did a wonderful job of keeping the project on track for a timely conclusion. I highly recommend TECKpert to anyone looking for digital marketing services."